Accurate and thorough diagnosis code documentation can support medical necessity for Cardea SOLO use. 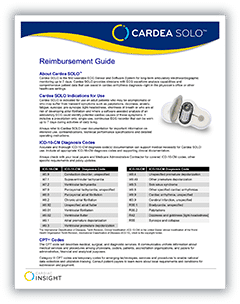 Cardiac Insight can provide support to physicians and facility providers treating patients with Cardea SOLO. Information provided here is for convenience and general information purposes only. It is obtained from publicly available, third-party sources and is subject to error, omission or change without notice due to complex and frequently changing laws, regulations, rules and policies. Cardiac Insight makes no representation, statement, promise or guarantee of coverage or levels of reimbursement. Payments will vary by geographic location and payer. Always refer to the patient’s insurance plan and/or the local Medicare Administrative Contractor for Local Coverage Determinations (LCDs) and for any additional requirements and guidance for coding, coverage and payment. Telephone and email inquiries will be answered within 24 hours. For more information, please consult our Reimbursement Guide.